Government, civil society and faith leaders from 40 nations addressed the need to advance social cohesion in diverse societies in areas of interfaith cooperation, education, community and economic development, family and youth empowerment, among others as a catalyst for peace. the 2013 Global Peace Convention. 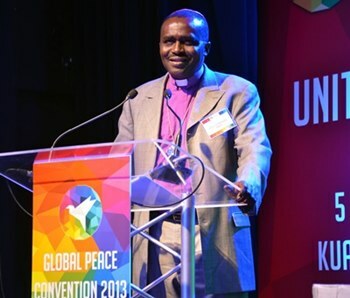 More than 1,200 government, civil society and faith leaders from 40 nations addressed the need to advance social cohesion in diverse societies at the fifth annual Global Peace Convention (GPC) in Kuala Lumpur, Malaysia on December 5-8, 2013. The three-day convening, “Unity in Diversity: Building Social Cohesion for Sustainable Peace through Universal Aspirations, Principles, and Values,” presented proposals and strategic assessments in areas of interfaith cooperation, education, community and economic development, family and youth empowerment, volunteer service, women in leadership, and business investment as a catalyst for peace. The first to be hosted in a Muslim nation, the 2013 Convention drew upon Malaysia’s rich experience in melding a country from religiously and culturally diverse peoples.